Based on Mackenzi Lee's popular weekly Twitter series of the same name, Bygone Badass Broads features 52 remarkable and forgotten trail-blazing women from all over the world. With tales of heroism and cunning, witty bios and in-depth storytelling, Bygone Badass Broads will give new life to these historic female pioneers. Starting in the 5th Century BC and continuing to the present, the book takes a closer look at the bold and inspiring women who dared to step outside of traditional gender roles for their times. Coupled with illustrations and Lee's Drunk History-esque storytelling style, this book is an outright celebration of the badass women who paved the way for the rest of us. 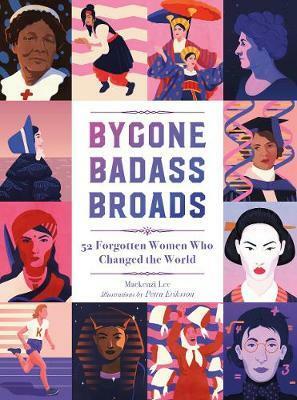 "Based on author Mackenzi Lee's popular weekly Twitter series of the same name, Bygone Badass Broads features 52 remarkable and forgotten trailblazing women from all over the world. With tales of heroism and cunning, Bygone Badass Broads gives new life to these historic female pioneers. Starting in the fifth century BC and extending to the present day, the book takes a close look at bold and inspiring women who dared to be different. Coupled with riveting illustrations by Petra Eriksson, this book is an outright celebration of the badass women who paved the way for you and me. Mackenzi Lee holds a BA in history and an MFA in writing for children and young adults from Simmons College. She is the New York Times bestselling author of the historical fantasy novels This Monstrous Thing and The Gentleman s Guideto Vice and Virtue , as well as the forthcoming The Lady s Guide to Petticoats and Piracy (2018) and Semper Augustus (2019). She currently calls Boston home, where she works as an independent bookstore manager.